Alright, so let's get started. 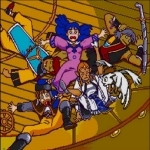 Between today and next Tuesday, I plan to play from the beginning of the game to the ship's departure from Saith. I'll post here with some thoughts after I play whatever I get to. Feel free to jump in. Any trivia? Funny jokes? Groan-worthy events? Throw those in. I'll find out myself whether that's not enough time. Also, I encourage you to use the materials on the soon-to-be-complete SSSC section (thanks Kizyr!) if you want to show something but don't have immediate access to screen capture technology. Sonic# wrote: Also, I encourage you to use the materials on the soon-to-be-complete SSSC section (thanks Kizyr!) if you want to show something but don't have immediate access to screen capture technology. If you're playing on your iPhone, press the top button and home button at the same time. This will store a screenshot in your camera library. That's great to know! Though possibly counterproductive for me as when I started TSS on Gens I took nearly a thousand screenshots before even leaving Caldor Isle, and that has a lot less dialogue. I hope to be involved with this, but may need to fake it at first; I'm horribly sick and will be traveling. I can paste my notes from my last start at playing through SSSC though. So, I've gotten to Saith a little ahead of schedule. It took me a little more than an hour. I died in my second battle and had to restart the game because I hadn't saved yet. My second try, I sold a Star Light to get better equipment. I avoid any battle I can. At this point (post hag's hut) I'm level 7/8. Designwise, the first dungeon is really fun - several ways to go, you gain MP when you level up, and you level up fast. For only the second time ever, I'm not saving sword dance for bosses. I love Laike, by the way. As the first (!) example of an adventurer the party actually meets, it's clear that he knows more than he should (commenting on green eyes), but that his skills at adventuring come from experience and having learned how to do it. Among all these damn kids, he's a grizzled veteran. The game is really good about using NPCs and music for foreshadowing. On Ramus's introduction (postcutscene), the music is the same as Dross's shop in Meribia. Characters mention Dyne, Alex's likeness to him, and (enigmatically) the events that led to his disappearance: "Dyne surrendered his most precious gift." Alex and Luna. I'm struck this time by just how familiar they are with one another. The connection between them is already there - the drama comes with the dream, and the perceived anxiety of going out into the world for the first time, and a changing body that feels the necessity of a magical song to lift the fog in the Weird Woods. "Search for my brothers Red, Blue, and Black." I don't feel so bad about originally thinking the dragons were all male. In Saith, there's a bit of the humor I remember. A guy is complaining about city life getting worse in Meribia, especially crime, and Nall comments that he probably doesn't have the statistics to back up his theory. Saith also introduces Nash ("weird guy," or guy from Magic Guild) and prejudice against Beastmen (indirectly, with a Beastman asking something). The hag took my fortune staff because I talked to her too many times. Are you playing the PS version? I don't remember getting MP on level-up. And I haven't tested this, but I have a pretty strong guess that it's actually a good thing if the Hag takes the Fortune Cane -- later on, you can get the Ice Mace from her, when you return to Caldor Isle with Ghaleon. The guide says this is triggered by talking to the Hag's sister on Black Rose St., but I think it's very likely that it's (also?) conditioned by giving her the Fortune Cane; this would be typical of the game (cf. paying Ramus's 30 S debt at the beginning of the game in order to get the last two bromides at the very end). I'll try to remember not to give her the Fortune Cane myself in this playthrough, assuming the triggers are all the same on the iOS version. Sonic#, if it's all the same to you, do you think you can avoid talking to the Hag's sister in Black Rose St. and see if you still get the Ice Mace later in the game? My SSSC notes suggest I was level 8 getting to the Weird Woods, because in that section I note that Alex gains an attack at level 9 and gets Explosion Staff at level 10. After clearing out all the monsters before the event battle, everyone was a bit shy of level 10, so went back to Burg to heal and sell the spare equipment I forgot, and to make the monsters regenerate. At Level 10, Alex learns Explosion Staff (EZ), and Luna learns Tranquil Song (AA). Luna can knock out a Flytrapper by herself with the Short Sword (which she swings backhanded). Her Temptation song also works somewhat on the goblins and gorgons. Paid off Ramus’s debt, then sold the Angel Tear and Star Light. Bought Poison Darts for Luna, Short Swords for Alex and Ramus, Heavy Clothes for Alex, and Wooden Shields for Alex and Ramus (a better deal than the clothes). Gave Luna Ramus’s Garbage Can Lid. Sold the daggers, sling, and Alex’s original clothes. So after getting killed off from absentmindedly giving Luna the Dagger/Knife (thinking it was a Short Sword, maybe, because of the name changes... eh, I really have no excuse) I reloaded, followed my own advice, and went in again. First battle I accidentally picked AI and so Alex used Sword Dance on a Slime. Sigh. Somewhat later I wasn't paying attention when I put the phone down and got into a battle I wasn't ready for, then got killed off again. Oh well. One thing I hadn't noticed before is that the Flame Ring, with its attribute of halving damage of wind and water attacks, is therefore useful against the Albino Baboon/Snowsquatch's Ice Shot. I've been working without a guide this playthrough. I talked to most NPCs, but (of course) missed paying off Ramus's debt. I suspect it's too late to pay off after the White Dragon Cave - oh well. I'm playing the PS version. Getting the MP added to the max MP was a great boon for being able to use Alex's Sword Dance against more difficult enemies like the Albino Baboon. I'll avoid talking to the hag in Meribia and see what happens. I'd remembered that talking to her got me an Ice Mace, but I didn't realize whether there was another trigger. Finally, this is perhaps my first playthrough where I rely on status magic a lot. I used Temptation Song all through the Weird Woods. (I love the bonus damage when monsters are asleep!) In prior playthroughs, trying to fight every monster, I didn't have enough HP to do so. In this playthrough, while I'm of lower level, I have enough MP to use magic in each battle. 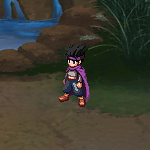 Nash only exacerbates this tendency, since I could use his magic in practically every battle anyhow. I realized later what you meant by the MP recovery. Still chugging through this, tweaking my notes. So easy to become compulsive and try to record all lines of dialogue, which I really should not take the time to do. Still, I'm not entirely sorry to have been checking, because I'm sure I missed the line in the attached screenshot on previous plays. As I play through this section I'm reminded again of how shortchanged Ramus is for credit in getting this whole quest thing started. Quark addresses all his important comments to Alex (and Luna), but Ramus is the one who starts them on the journey, who provokes Quark into setting them the Dragon Trial by demanding the Diamond, who chivvies Alex into journeying to the continent to sell the diamond... really, he passes the Trial just as much, since he does some important fighting. Alex wasn't even thinking of it until Quark tells him that it was only the first step. And if I recall correctly, he's also essential in getting to the mainland because of catching Brett cheating while trying to recover the Sea Chart, though I haven't gotten there yet in this playthrough. Alex may go to Dyne's Monument daily and dream of becoming a Dragonmaster, but Ramus actually gets out and makes his own dream happen -- jumpstarting Alex's in the process. And for all that ambition, even Alex's father thinks that maybe Alex coerced Ramus into going to the cave rather than the other way around. Poor guy. Wrote reply, deleted it accidentally. Short answer - yes, Ramus does get neglected. He only says one word to Laike, and is not addressed thereafter! 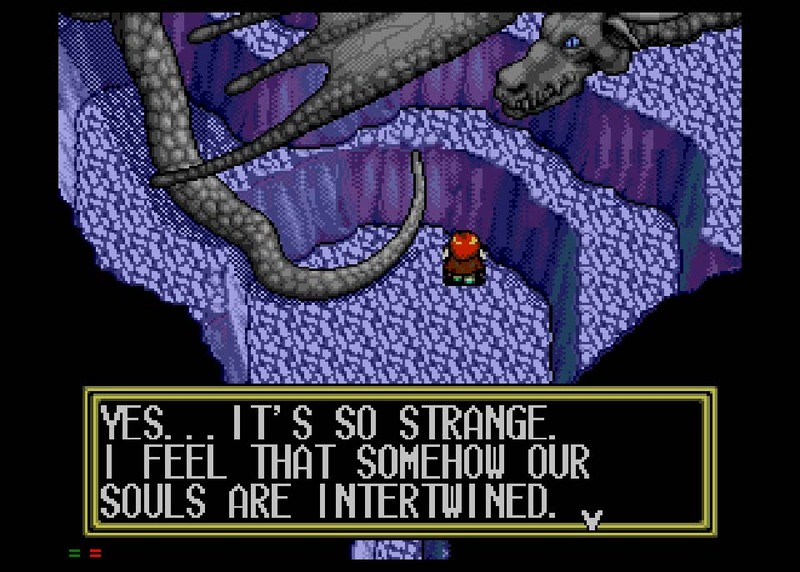 I found it also interesting how Luna is the primary focus as Alex and the others introduce themselves to the White Dragon initially, and Alex is really only the focus afterwards. It never seems like Ramus feels slighted though; his goal has never been to become Dragonmaster, and he's already obtained the first part of what he wants. Actually, I just replayed that section to transcribe it, and found my note that Alex essentially gets tricked into taking the Dragon Trial. Ramus is the one who asks for the Diamond (not very well, but he does do it), and Quark says to bring him the ring in order to get the diamond. It's only after getting the diamond that there's any mention of Alex wanting to become a Dragonmaster. You'd think it'd be on his mind, but perhaps the process of how to become one just isn't well known. So really, Luna and Ramus pass the Trial just as much as he does. Quark even notes that Ramus and company "braved so dangerous a course to secure a Dragon Diamond", and it's always the children, plural, who are retrieving the ring. So I maintain that Ramus did all the heavy lifting as far as actually getting Alex to the point of being considered a Dragonmaster candidate. He gets shortchanged in credit for this by other people in and out of the game, even though he does, as you say, get what he actually wants as well. As far as only saying one word to Laike, well, he falls asleep as soon as introductions are completed, which isn't surprising after one to three major battles. Luna conks out only a few lines later herself. And while Ramus is the impetus behind the adventure's beginning, he really isn't a fighter, nor is he marked by destiny the way Luna and Alex are, so it's not surprising that he's in the background then. Re Luna's interest to Quark, it's kind of odd that Quark is tentative about knowing her, but is pretty up-front when confirming to Ghaleon who she is. My take is that Quark didn't want Luna getting too suspicious about who she really is. I also think he didn't want to burnen her with the knowledge that she is Althena when, based on how Dyne gave Luna to Alex's dad without telling him who she really was, she wasn't supposed to know this (at least in this stage of her life). However, with Ghaleon, I feel he was open about it because he thought he could trust Ghaleon to use it for good intentions. There wouldn't be any point in mentioning anything to her at all, then. After all, the focus in that meeting is on Alex, the would-be Dragonmaster. I think it's just a continuity error, to give Ghaleon a reason for kidnapping her right then rather than Xenobia grabbing her as she does in TSS. Ghaleon's already pretty sure Luna is the one from the singing in the Crystal Tower, while in TSS he hadn't met her at all, or only very briefly. In TSS, Quark similarly sort-of recognizes her (I think; couldn't reach my notes, but this screenshot looks like it) but there's no mention of her when Ghaleon returns with Alex. Ah. My mistake. Looking back at it, Alex's first meeting with Quark is just about Alex becoming the Dragonmaster and the line about Luna seems like it's just meant to be foreshadowing. It was fine in TSS since you have Luna with you in the party for so little time, but SSSC smacks you in the face with so much foreshadowing about Luna being special that it seems unnecessary. The again, subtle foreshadowing isn't exactly Lunar's strong suit. I'm probably way overthinking it. Hey, we're all about the overthinking here. Though tempered with the realities of it being a collection of fiction with many, many cooks contributing to the broth, when needed. There's the actual text with errors and inconsistencies from that, and there's the story, involving the reading between the lines and going further than the writers and translators likely did themselves to flesh out a world bigger than the sum of its parts...and finding the balance of when the former tempers the latter. I think it's fun to read deeper into the text of something and find subtle things, like the status of magic in the Lunar universe, but it can be hard because you'll notice enough plotholes to the point where it'll detract from your enjoyment of the series. As I get older, I find that I'm trying to be less critical of things like the plotholes in SSSC and things like the differences in the map between TSS/SSSC and EB so that I don't spend my time playing trying to iron out the inconsistencies in my head instead of enjoying the games for what they are. Enclave wrote: I think it's fun to read deeper into the text of something and find subtle things, like the status of magic in the Lunar universe, but it can be hard because you'll notice enough plotholes to the point where it'll detract from your enjoyment of the series. Oh and sometimes the inconsistencies between different games' retelling of the events (not just events between remakes -- but, say, what TSS, SSS, EB, and EBC all say about what occurred in the distant past, and how games like Dragon Song come along and completely disregard that consistency). That's what detracts from the games the most for me these days. But... I try to just chalk it up to the games being like legends, different retellings that normally don't quite sync up. This guy, HCBailey, did a Let's play of Lunar SSSC. Playstation model, naturally. I've been doing a new playthrough of SSSC this week, and stumbled across this topic. I'm curious now if I'll end up getting the end game bromides from Ramus--I paid his debt, but it was after the White Dragon Cave, but before leaving for the Weird Woods the first time with just Ramus. This is also the first playthrough that I'm using magic more in regular battles; I used to conserve Alex's MP even if I knew nothing was ahead. I didn't used to use Temptation Song, either, but I refused Laike's help the first time & I desperately needed the help it gave in that battle. HikariOmoi wrote: I've been doing a new playthrough of SSSC this week, and stumbled across this topic. I'm curious now if I'll end up getting the end game bromides from Ramus--I paid his debt, but it was after the White Dragon Cave, but before leaving for the Weird Woods the first time with just Ramus. As far as I know, it doesn't matter when you pay the debt, just if you pay the debt. When it's too late to pay, the option no longer presents itself. Kizyr wrote: As far as I know, it doesn't matter when you pay the debt, just if you pay the debt. When it's too late to pay, the option no longer presents itself. Ohh, that's good to know! Thank you!